We are living in a period of history where many of us perceive that the rate of change is increasing - trends within music, fashion and lifestyle are changing at an astonishing rate as a result of today's digital economy where content is ephemeral. In the past we used images to remember a moment in time, today we use Instagram and Snapchat to communicate and express ourselves in a brief moment. New startups are challenging big businesses by tapping into the on-demand economy and delivering services and products in new innovative ways. Change is no longer linear, it's exponential and this is not just impacting us as individuals but also creating disruption for large companies that have been around for a long time. The average lifespan of a Fortune 500 company in 1920 was 67 years, while today in 2015 it's only 15 years according to Richard Foster from Yale University. In the visualisation above you can see that YouTube was acquired by Google at a cost of US$1.4 billion only 18 months after the platform was created. Uber is another example of a startup that have grown exponentially - they started in 2009 and now they are valued at US$50 billion. AirBnB have experienced similar growth and have now raised fundings that values it US$20 billion. 40% of today's Fortune 500 businesses will be gone in the following 10 years according to researchers at US’s Babson Olin School of Business. 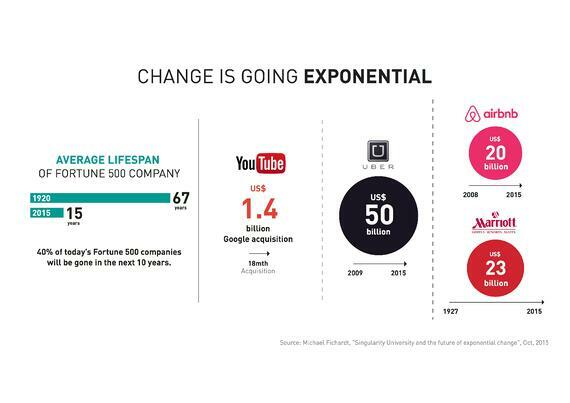 Many large companies are recognizing the technological and demographic trends that are driving this exponential change, but are they adapting and innovating fast enough? Do you want your brand to thrive in today's digital landscape? Our Brand Workbook will help you with great models and insightful questions to get you thinking about creating a more impactful future brand. Download it now!